Rafael Nadal believes the changes could work. 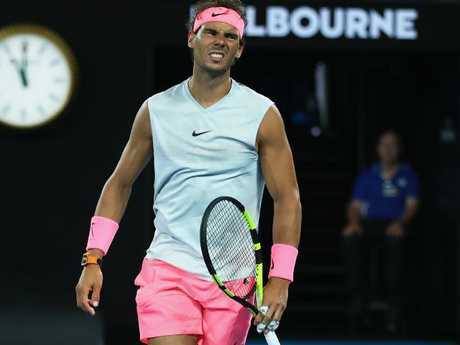 SPORTS Entertainment Network (SEN) tennis expert and Australian Open TV presenter Brett Phillips has taken aim at Rafael Nadal and tennis officials over his continual time wasting. The Spaniard is known for pushing the boundaries - and often exceeding them - when it comes to taking advantage of the 25 seconds players are allotted between points. He has received time violations in the past - but according to Phillips, not nearly enough. The host of SEN tennis program The First Serve says Nadal has been receiving preferential treatment for far too long because of his ranking and status in the sport. "Grunting is one thing but there's a bigger issue with Nadal and that's the amount of time it takes him to play a tennis match. He gets away with absolute murder let me tell you," Phillips told Andy Maher and Nick Dal Santo when discussing his quarter-final against Marin Cilic on SEN radio on Wednesday afternoon. "Look at the bloke at the other end of the court who's got two towels, he's got to sort his drink bottles out - he wastes everyone's time. "He's got away with it for that long. "I love him (Nadal) and it's hard not to love him but watching his tennis matches are painful at times. That's hard to say about someone who's reached the top of the mountain. "Absolutely (officials cut him slack). The ATP are looking at all these innovations right now - the ATP tournament where there's a shot clock. Nadal hates it because he wouldn't be able to do all the things he wants to do - get his towels sorted and his drink bottles and everything else. "He's always making everyone wait and he's got away with it for far too long. Let's hope with the next generation they sort that out." Nadal is famous for his attention to detail, needing all his drink bottles to be lined up in a row with the labels facing the same direction before he can start a point. His obsessive superstitions are part of the reason he takes longer than most to get through matches. Nadal retired in the fifth set of his quarter-final clash against Cilic, making it just the second time in 264 grand slam encounters the World No. 1 has pulled out mid-match. As Phillips mentioned, Cilic copped a warning for time wasting in the second set but Nadal escaped scot-free. The Croatian was warned just before serving when down break point and he recorded a double fault to hand Nadal a 3-2 lead. Cilic let the chair umpire know during the change of ends there was a better moment for her to pick when he should have been given the warning for taking longer than 25 seconds in between points. Channel 7 commentator Jim Courier said the chair umpire has a device to measure how long each player takes in between serves. He said the umpire's decision to warn Cilic on break-point down was difficult to understand when Seven statisticians recorded that Cilic went over the 25 second mark 40 per cent of the time, while Nadal was responsible for going over his allotted time 45 per cent of the time - and escaped any warning. He said Nadal has a reputation for being a habitual line-stepper of the time allowed in between serves, but is not punished because of his stature as the No. 1 ranked player. 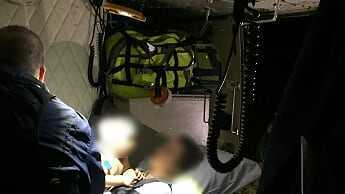 "She will know that these guys are going over the line," Courier said. "The thing for Cilic is to get one when you are down break point if you have done it so many times. That unfortunately is a pattern we see time and time again with certain umpires. They wait until the absolute worst time. Do it after the first point of a service game. "Rafa is notorious for stretching the limits and matches take so long. That's part of the reason." 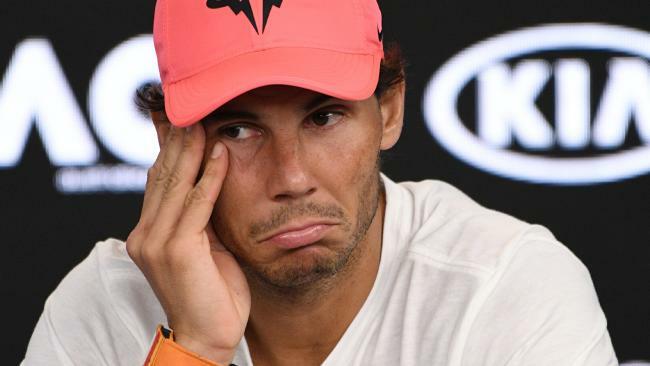 Nadal will be taking even more time between points now an MRI scan confirmed he had a torn anterior hip muscle that will sideline him for three weeks. "The MRI showed a grade 1 injury of his illiopsoas on his right leg," a statement from his management said. "He will be resting the next days once back in Spin and will start with anti-inflammatory (and) physiotherapy. "He will his rehabilitation and pre-adaptation process to the tennis court in two weeks, starting progressively his training and practice. "Three weeks is the normal time to totally recover and he will resume his tennis schedule as planned, playing Acapulco (in late February)."